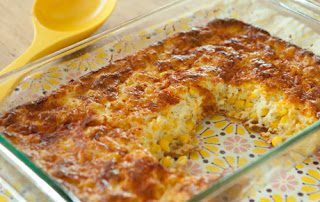 This dish is always a hit, and I’ve lightened it up a bit by using 1/2 cup of cream and 1 1/2 cups milk instead of all cream. It’s just as good. Of course there is that butter…but it’s worth it! 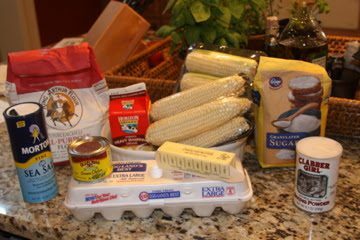 1/4 cup sugar 3 TBSP flour 2 tsp baking powder 1 1/2 tsp salt 6 large eggs 2 cups whipping cream (see above) 1/2 cup butter, melted 6 cups corn kernels (~12 ears of corn) Preheat oven to 350 degrees. Combine first 4 ingredients. Whisk together eggs, whipping cream and butter. 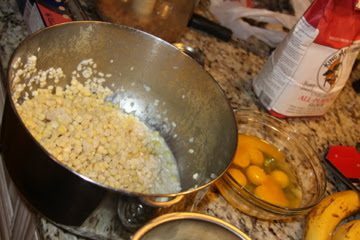 Gradually add sugar mixture in, whisking until smooth, then stir in corn. Pour mixture in a lightly greased 9x13 inch pan. Bake for 45 minutes or until golden brown and set.